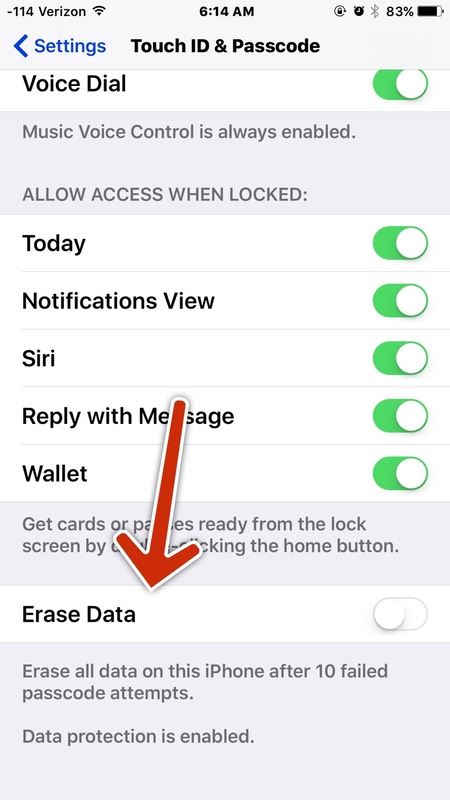 With the Apple iOS security so much in the news lately, I was thinking about the setting under Passcode, where the device is erased/wiped after 10 failed passcode entry attempts. I wonder about the innocent failure - your 3 year old niece grabs your phone without you looking, and starts typing and typing and typing - and whoops your phone is wiped. Assuming you have a backup, for you it is no worse than a manual full reset and restore of backup, right? It doesn't affect any backups you have made of your device, correct? Thanks for confirming what I thought! I wouldn't worry about that scenario too much because there are timers between passcode attempts. I believe it is after the 5th attempt. Is this what Y'all refer to? I don't even keep it toggled on. Depending on how you prefer to balance security and convenience, you could also switch from a numeric passcode to a strong alphanumeric password. Rather than erasing data to be secure, it would just make it exponentially harder to ever brute force. I changed my passcode to custom numeric (it's one of the options) which allows me to choose a numeric passcode of my choice of length, and you have to hit ok to confirm it. That way anybody who finds or steals my phone won't know how many numbers are in the passcode and it's still fat finger compatible. Good point! May have to try that.